I believe these may have been available in the USA Nissan Motorsports Catalog. Don't know what the old brown tape is about. The 1200 tach has a glass front that is not attached to the tacho. In the Coupe Dash, the tacho has a glass front that sits in the dash, then the tacho is screwed down onto it. I expect this competition one is the same, and is designed to sit in the coupe dash, or in the centre console, as discussed in a previous thread. The Tape is holding it all together for storage..I think. This is the Kantoseiki tach. I see it in pics of japanese 1200s. This white car from Portland, Oregon has one as well. Isn't the standard optional tacho 10,000 rpm? 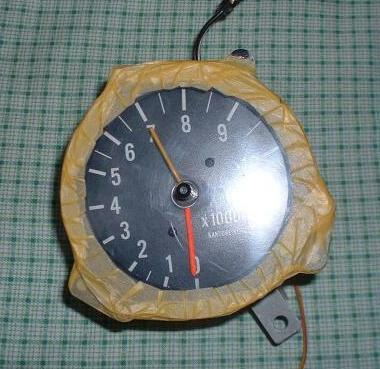 I think you'll find it's 8000rpm. I'd need to check when I get home.